What did young Lodolfo find in the ninth century as he looked for shelter underneath Mount Catria, animated only by his inmost yearning for contemplation and loneliness? Nowadays, it may be difficult to understand why he chose to settle down in that special place, together with a handful of peers from Gubbio. Was it an experience of silence in the ancient beech forest, the spring itself or maybe their longing for the Divine? The woods of the north/east Apennines were already well known places for spiritual retreat of the ancient Umbrian population. The foundation of the first cells for the monks, in white chalkstone, started about the first millennium near the most important springs of the area. The church, a minor basilica, was consecrated at the end of the 12th century, dedicated to St. Andrew and the Holy Cross. 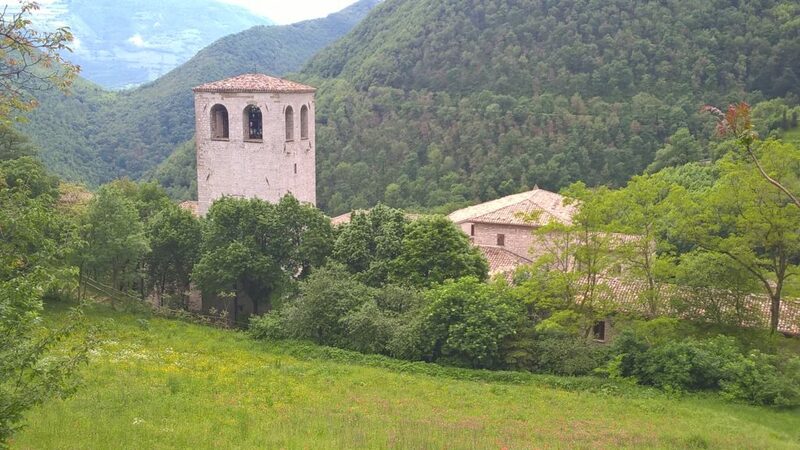 The name of the monastery “Fonte Avellana” does not only depend on the natural abundance of hazelnut trees (Corylus avellana L.), but also on expressions associated to pre-Christian terminologies such as “auantia” (celtic, spring) and “Avernus” (latin, a place inhabited by ancestors). Fonte Avellana is situated in a natural amphitheater at the foot of Mount Catria (1701 m) and we can still see the well in the Botanical Garden, near the age-old yew tree. 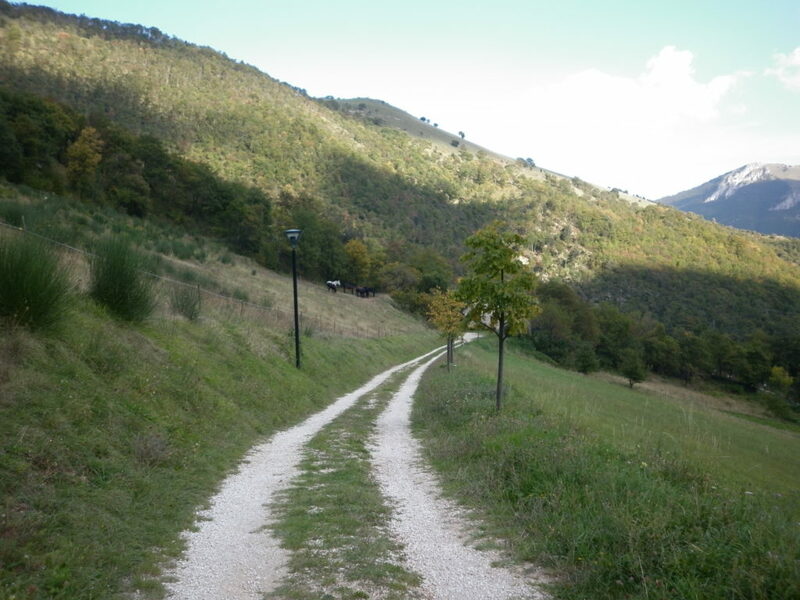 Let us take a step back and observe the landscape of Fonte Avellana from a very far distance. From the Adriatic coast, we can see how the limestone massive of the Mount Catria rises in the hilly countryside. Between its northern face (Marche) and the southern one (Umbria) countless narrow valleys and canyons hide hermitages and minor sanctuaries, most of them ruins, entwined with thorns and brambles. Built on the Byzantine corridor, between Ravenna and Rome, many of these places were not only spiritual retreats but also hideouts both for pilgrims and outlaws. This might have been one of the reasons why St. Romuald (951-1027) arrived in this area in the first Millennium. 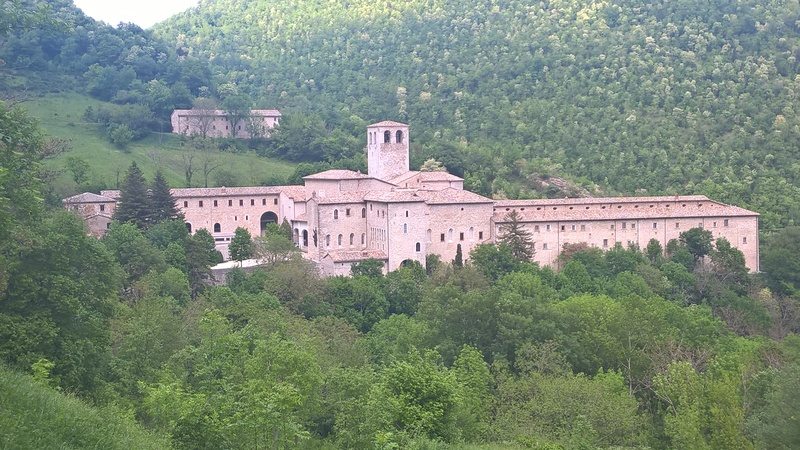 For several years the founder of the Benedictine Camaldolese monastic order stayed in a cell of S. Maria di Sitria, a small abbey he built some miles from Fonte Avellana, fighting for the renewal and greater organization among the hermits living in northern and central Italy. The ascendancy of Fonte Avellana began with the charismatic figure of St. Peter Damian (1007-1072) when he became the prior. Within a short period the monastery became a center of religious, cultural and social initiatives, even the most famous Dante Alighieri wrote a sonnet about Fonte Avellana in his Divine Comedy. The monastery and its properties were administered exemplarily, and until the end of the 14th century the domains of Fonte Avellana almost reached the Adriatic Sea. That was until the Vatican decided to send its own abbots owing to the decline of this unique approach to territorial and sustainable administration. After the closure under Napoleon and later under the unified Kingdom of Italy few monks kept living under Mount Catria. Only in the middle fifties of the nineteenth century were all buildings renovated and the monastery was opened to external visitors again. In this particular scenario, offered by Mount Catria’s nature and within the monastery’s limestone walls do the outside and the inside become an impressive experience of the centuries old Camaldolese tradition. The monks live in community in the well-balanced rhythm of the Liturgy of the Hours, and at the same time they consider openness and hospitality as fundamental values of their choice of life and spirituality. Visitors looking for time off for contemplation, private studying or enriching conversations are welcomed in specified parts of the buildings, either on their own or taking part in courses and seminars. Every year the community organizes or offers conferences, classes and courses about several inter-confessional topics, self-directed or held by external experts from all over Italy and Europe. There is a big refectory in the former cellars, which offers the traditional cuisine of the Marche region. A series of former monk cells were converted to comfortable rooms for the guests, there are also various conference halls and a vast library opened for visitors, as well as the beautiful scriptorium with its 13 windows aligned with the position of the sun. The historical library of the monks can be visited only on demand by researchers; it contains volumes and manuscripts from the 15th century until now. Liturgy of Hours and the Holy Mass are held in the Basilica or in the underground Crypt, visitors are always welcome. The emblem of the Camaldolese shows two doves sipping from the same Chalice under a star. It expresses the encounter of the way of life of solitude against that of life in the religious community, according to the reform of St. Romuald. In Fonte Avellana, in the silence of its forests, we can sense this ancient yet contemporary commitment as a balm for our soul, in a world of sudden changes.